For the week just ended, the ringgit was traded higher following positive foreign net inflow. KUALA LUMPUR: The ringgit is likely to appreciate further against the US dollar next week, bolstered by improving risk appetite for the former amid the weakening of the latter. A dealer said if the buying momentum continues next week, the local unit would likely find resistance at around the 3.90-level. "The current sentiment for the ringgit is positive. With the US dollar declining and crude oil prices continuing to improve, the ringgit can increase further," the dealer told Bernama. For the week just ended, the ringgit was traded higher following positive foreign net inflow, after Malaysia reported its biggest trade surplus in nine months. Malaysia's total trade slipped 0.8 per cent to RM122.86 billion in August 2015. Exports grew 4.1 per cent to RM66.53 billion and imports declined by 6.1 per cent to RM56.34 billion, giving a surplus of RM10.19 billion. The continued strengthening of crude oil prices has also injected positive vibes into the market. Meanwhile, the US dollar lost ground globally after the Federal Open Markets Committee meeting minutes signalled the central bank's decision to keep interest rates at near zero at its September meeting. This boosted Asian currencies as well as stock exchange markets, including the ringgit and Bursa Malaysia. On a Friday-to-Friday basis, the local unit rallied to end the week at a seven-week high of 4.1310/1400 compared to 4.4100/4180 last Friday on the back of improved sentiment. 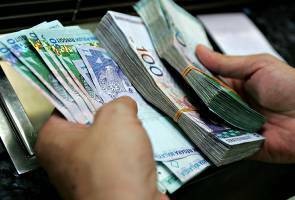 The ringgit also ended the week broadly higher against other major currencies. It rose against the Singapore dollar to 2.9587/9656 from 3.0747/0811 last Friday and strengthened against the yen to 3.4356/4445 from 3.6704/6783. The local unit went up sharply higher versus the pound sterling to 6.3448/3595 from 6.6834/6977 last week, and appreciated against the euro to 4.6775/6886 from 4.9224/9323 previously.